Profitez d'une arrivée ou d'un départ sans tracas à Albufeira grâce à ce service de transfert privé depuis et vers l'aéroport de Faro. Rencontrez votre chauffeur anglophone à l'aéroport de Faro ou à votre hôtel et détendez-vous dans le sens inverse du trajet vers votre hôtel, votre résidence privée ou l'aéroport. Ces véhicules privés peuvent accueillir jusqu'à huit passagers. I had some questions to ask about my booking which were answered very quickly and in a very professional manner. 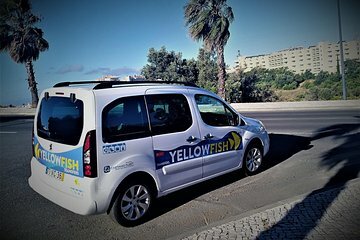 When I arrived at Faro I was delighted to see that my Driver was readily identifiable in his Yellow polo shirt and was displaying my name on a hand held device. The Trip to Albufeira was comfortable and more importantly driven at a reasonable speed with no white knuckle moments. Really cool in the car with WiFi etc. Made good time to Albufeira. Return trip was equally as good. Lady driver was spot on time and once again no excessive speed, she was a very good driver too same as her male colleague on the inbound trip. Would definitely use YellowFish again. It is a shame they don't operate in other countries. On time, polite and prices reasonable. Used as transfer to and from Fargo airport, would highly recommend and use again. Driver waiting at airport upon arrival, friendly and polite. Return trip driver was 15 minutes early so no worries about if he'd turn up. The transport from the airport to the resort was fast and efficient. Our driver Anna was very friendly and knowledgable about the area and had many good suggestions for us as to where we should go. She was truly a delight. I would highly recommend yellow fish for your transfer needs.